Papergreat: 1921 postcard: "Please accept my hearty Christmas Greeting"
1921 postcard: "Please accept my hearty Christmas Greeting"
Today's Christmas postcard was published by a short-lived New York company called Bergman Quality. It was postmarked on December 26, 1921, with a stamp that denotes both Flushing and Forest Hills in Queens. 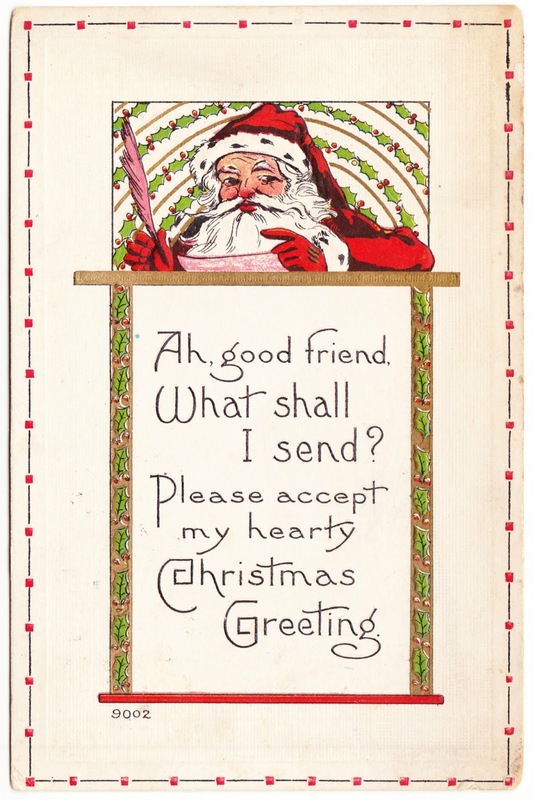 Underneath the jolly illustration of Santa Claus on the front is the caption "Ah, good friend, What shall I send? Please accept my hearty Christmas Greeting." I love the typography and especially the design of the C in Christmas and G in Greeting. This postcard helps us to confirm our solution to a mystery from earlier this year. It's addressed to Miss Lucy Steinhoff in Brooklyn. Her last name was badly misspelled as Stienhouph in a separate postcard I wrote about in September. The short message on the back of the card states: "Hope Santa will be good to you. Love Aunt Julia"
Merry Christmas... What even is happening here?